If you just deleted or messed up the files/folders today, then you want the most recent backup, which TSM calls the active backup. These are the files that TSM restores by default. If this is what you want, then just open the Restore window, select the files or directories you want to restore and click Restore. Don't worry about dates. If you have discovered that your files/folders were corrupted by a software bug or virus or your mistake some time ago, you should do a Point In Time backup, specifying a time that you know is before the corruption occurred. The example in the previous section is a Point in Time backup. You still don't really have to worry about dates, except for telling the client when the latest time you know the file was good. In your Mac Applications folder, open your TSM client folder, then if you are restoring only your files, you can use the Tivoli Storage Manager. 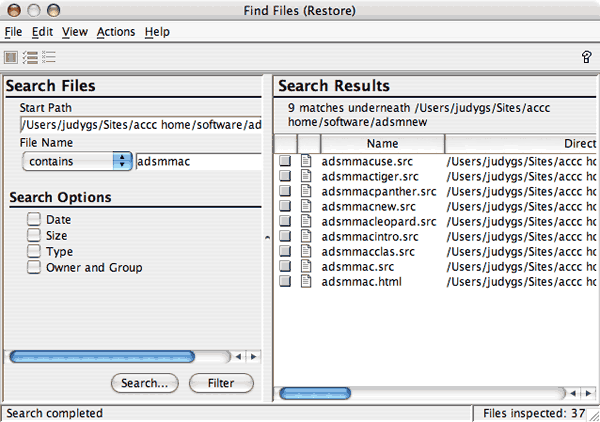 If you are restoring other files, use the TSM Tool for Administrators. You should now see the TSM Main Menu screen. Click on the Restore button. The Restore window will open. You select the files you want to backup on this window, from the File Level, starting at Macintosh HD. Click the blue triangle beside a directory name to expand that directory; click in the gray box by any directory or file name that you want to restore. The details of the boxes varies depending on the version of TSM you are using. To search for files, click on Edit menu then Find. Select a start path (the closer to where the file you're looking for, the better) and type the name of a file or directory you want to search for and click Search. To perform a Point In Time restore that restores the selected files to what they were like at a selected dated and time, click the Point In Time button, select the Point in Time date, and click OK, then select the file(s) and/or directories you want to restore. The Point in Time date will be displayed in the Restore window, beside the Point in Time button. If the Point in Time date is before any the oldest version of a file/directory in the backups, that file/directory won't be restored. 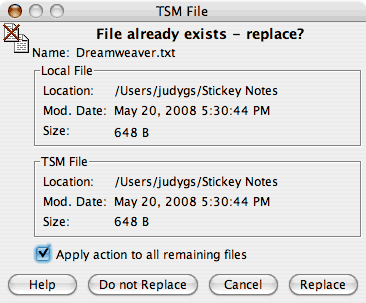 When I finished selecting files/directories that I want TSM to restore, I clicked Restore. If you want to replace your current file(s) with the restored file(s), click Replace; if not click Cancel. And click the Apply action to all remaining files if that applies. Because I'm restoring a folder that I messed up, I clicked Apply action to all remaining files, and clicked Replace. 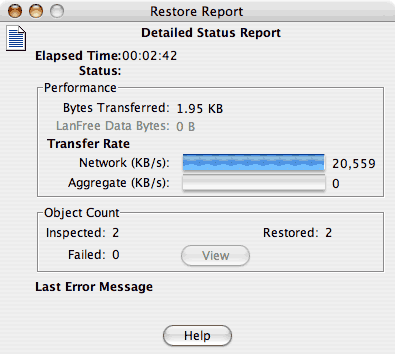 The Task List dialog box will show the progression of the restore. When the restore is finished, you'll receive a TSM message telling you that it's finished; click OK to close the dialog box. There will also be a Restore Report dialog box, giving the transfer rate and the number of objects restored and the number of objects that failed to restore. Click on the red dot on the left hand side to close this window and exit the TSM Client. You'll need to restore your whole disk when your hard drive dies or when you get a virus that totally trashes things or, heaven forbid, when someone steals your laptop. But this is the reason that you're using ADSM/TSM. And you will be happy that you did. TSM can only recover your files if you can run the backup client. If the disk that's lost is the one that the client was on, you'll have to reinstall the client before you can recover your files. Also, if the disk that you lost was the one that the operating system and the networking software was on, you'll have to reinstall them before you can use the TSM client and connect to the TSM server. Record the IP address, subnet mask, default router, and name servers in the TCP/IP Control Panel. You will use this information to reconfigure TCP/IP when you reinstall Mac OS. Record your nodename, TCP Server address, and TCP Port number from the Communications panel of the Preferences editor. The nodename information comes from the General panel in the Preferences editor. You will need this information to configure Tivoli Storage Manager so you can restore your data. Re-install the operating system from your Mac OS X installation media to access the network. Install the Tivoli Storage Manager for Mac for your current OS version. 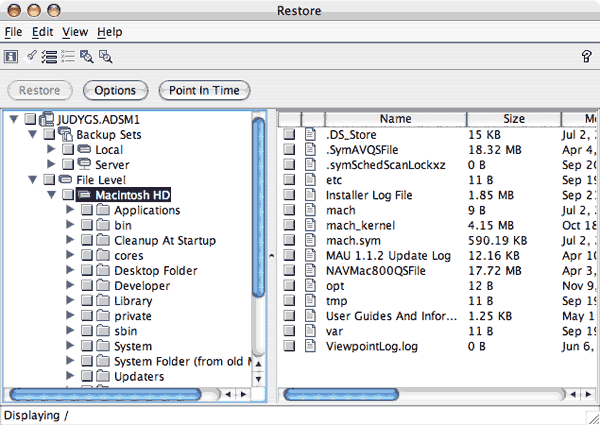 Open the TSM Client, click in the gray box next to Macintosh HD (or whichever disk you need to restore) and click Restore. You'll want to Restore to Original Location, most likely. Restoring a whole disk is going to take a long while. But even if it does, remember that TSM, and your using it to back up your Mac, is saving the day for you.